The U.S. government is easily the nation's largest investor in nanotechnology, with The House of Representatives passing a bill to invest $2.4 billion in the next three years. "Private equity sources can't bridge the gap from the lab to products"
Silicon Valley is fabled for its ability to build companies around esoteric technologies. But the uncertainty involved in nanotech investing is forcing many Bay Area firms to take a spot in Uncle Sam's queue. But why would Silicon Valley's libertarian technocrats anoint the slow-moving federal government as a nanotech savior? After all, high-profile companies like Nanosys Inc. and Nanomix Inc. have drawn tens of millions in venture capital. Because, in truth, most of the VCs that fund nano companies do so as a highly speculative part of their portfolios. Nanotech entrepreneurs "are competing for money with companies that have revenues and markets and are looking for late-stage investments," said Rich Helfrich, managing director at Alameda Capital. By comparison, nanotechnology firms look like research projects. Helfrich said that entrepreneurs need to find a path through "the Valley of Death" that exists between research completion and product release, and federal research grants look like the right vehicle. That was a clear theme at a recent nanotech forum organized at NASA Ames Research Center. Meyya Meyyappan, director of the Nanotechnology Research Center at Ames, said that "it takes 15 years to get from the lab to product," in hard science fields. That time frame requires far more patience than VCs can afford to have. "It's not like this is the sort of technology you can tinker around with in your garage," said Steve Jurvetson of Draper Fisher Jurvetson, one of the most aggressive investors in small tech firms. "There's sort of a funnel of opportunities (for private investment), and the contenders for it are largely funding themselves with government grants." Jurvetson said DFJ has now funded close to 18 small tech startups, and every one had some kind of government funding first. The U.S. government is easily the nation's largest investor in nanotechnology. 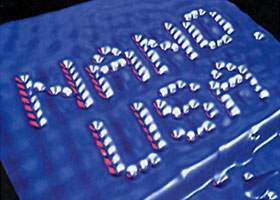 Various agencies will spend $774 million on nanotech research in fiscal 2003, and plan to spend $847 million in fiscal 2004. The House of Representatives in May passed a nano spending bill that would allot $2.4 billion over three years, and the Senate is expected to pass its version early in the fall session. U.S. Rep. Mike Honda, D-Calif., co-sponsor of the House bill, was a keynoter at the NASA Ames forum, where he urged nano researchers and entrepreneurs to aggressively seek out federal research dollars. "Private equity sources can't bridge the gap from the lab to products," he said. "The federal government can help by supporting this work." Honda encouraged entrepreneurs to link up with researchers working on grants, and in particular to apply for the Department of Defense's Small Business Innovation Research and Small Business Technology Transfer grants. Working with the feds makes sense to some. "Entrepreneurs need to recognize they aren't going to get VC funding," said Chris Piercy, president and chairman of the Northern California Nanotechnology Initiative, a regional coordinating body. "This is the new normal." But some entrepreneurs say SBIRs and the like are not well suited to nanotech startups. "You couldn't start a nanotech company based on SBIR funding," said Jeff Wyatt, director of business development at Nanomix. His counterpart at Nanosys, Stephen Empedocles, added that Silicon Valley's cost structure makes it hard to start a company with an SBIR, since the first phase is for a maximum of $100,000. "That's less than one full-time employee," Empedocles said. He said that the federal government is making plenty of money available for nanotech entrepreneurs, but many need to concentrate capital differently. Where it puts its capital is of grave concern to Bay Area policy-makers. Two of the three U.S. representatives in the Bay Area attended the forum, and both California senators sent representatives. Their message: the Bay Area needs to get organized or continue to lose out on federally funded centers like the ones in New York and Texas. While Silicon Valley may be the number-one place for nanotech right now, a number of the area's leaders fear that it will lose its pre-eminence - and lots of high-paying jobs - if it does not also draw large new centers for nano research. Not everyone in the valley agrees. Empedocles told the forum repeatedly that Nanosys could not have been founded anywhere in the world but Silicon Valley because of the availability of management and research talent, equipment makers and venture capital, among other things. Meanwhile, Todd Ewing, managing director of the San Francisco Center for Economic Development, downplayed the actual threat, saying the Bay Area still attracts plenty of money - with the Molecular Foundry under development at Lawrence Berkeley National Laboratory, the 60-plus nano researchers at NASA Ames, the National Nanofabrication Users Network at Stanford and a host of funded entrepreneurs. He also doubts that Albany and Austin have enough brainpower to make a run at the Bay Area, regardless of facilities. "I'll take our talent over their equipment any day," Ewing said.